The women's team sprint was coming down to a sprint finish for the gold medal Wednesday at the Winter Olympics, and like so many Alaskans who were watching with bated breath, Kikkan Randall was on pins and needles. She stood next to Sweden's Charlotte Kalla in the finish area at the Alpensia Ski Center in Pyeongchang, South Korea, as their teammates – Jessie Diggins for the United States, Stina Nilsson for Sweden – fought ferociously through the final few meters. When Diggins came from behind to capture the gold medal by .19 of a second, not even those with front-row seats knew who the winner was. "I was standing in the finish with Charlotte and we were both screaming at the top of our lungs for our teammates, so we were having our own little competition," Randall said Thursday at a press conference in Pyeongchang. This was something worth shouting about. 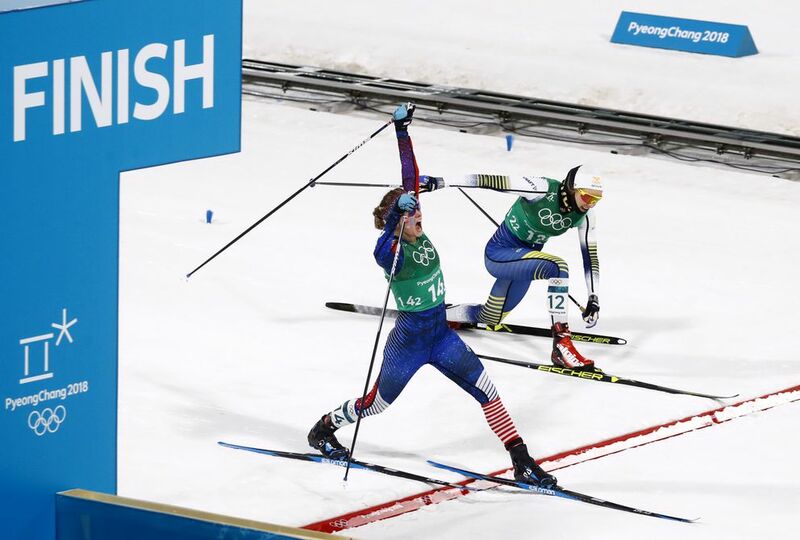 Randall, 35, and Diggins, 26, are the first American women to win Olympic medals in cross-country skiing. They ended a 42-year medal drought for the U.S. cross-country team, whose only other Olympic medal came in 1976 when Bill Koch skied to silver in the 30-kilometer race. 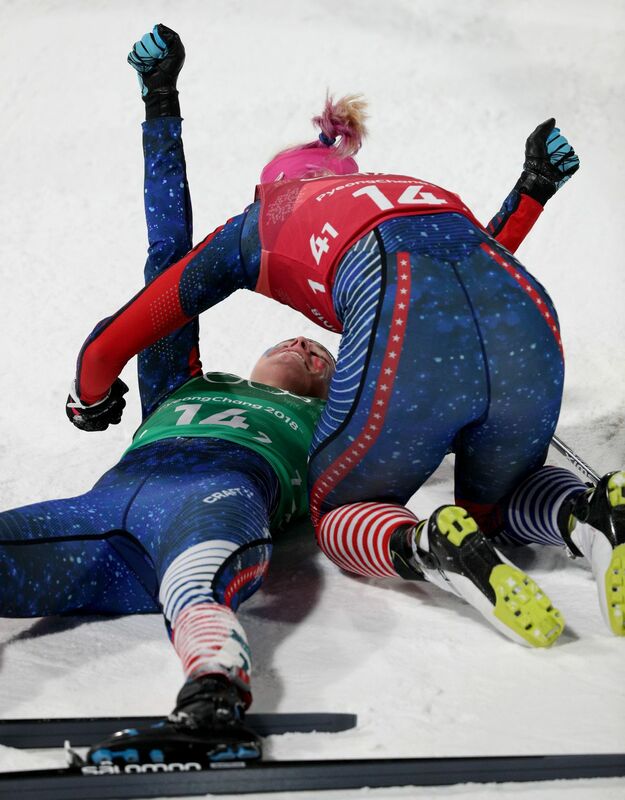 Diggins raised a pole in triumph as she lunged across the finish line, gave a big roar and collapsed to the ground on her back. Then came Randall, who pounced on Diggins to form the most jubilant two-woman dog pile in the history of dog piles. 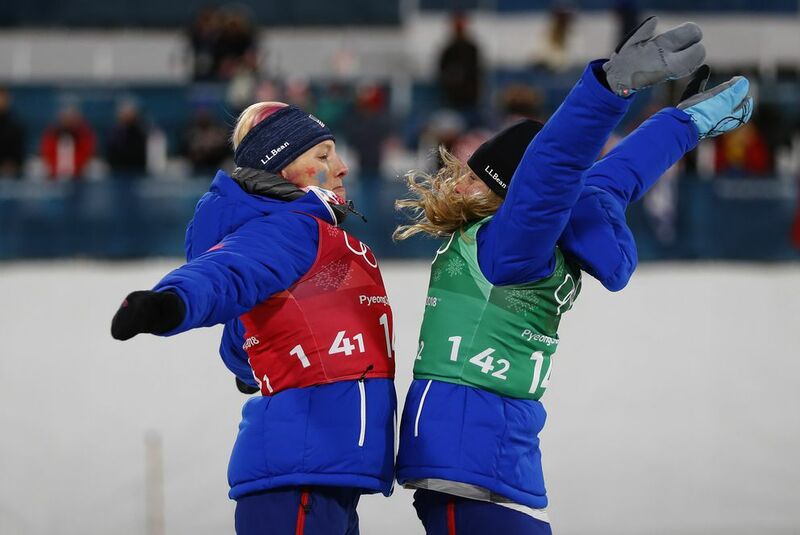 The pair won the 7.5-kilometer freestyle race in 15 minutes, 56.47 seconds, a heartbeat ahead of Sweden and 2.97 seconds ahead of Norway, whose bronze medal made Marit Bjoergen the most decorated athlete in the history of the Winter Olympics with 14 medals. Skiers took turns racing 1.25 kilometers at a time, with Randall going first and Diggins going second for the United States. During her fifth and final leg, Randall refused to let Sweden and Norway pull away, putting in a gritty effort that allowed her to tag off to Diggins in third place, .75 of a second off the lead. Those 1,250 meters were the last of Randall's Olympic career. She is a five-time Olympian who was a bright-eyed kid in Salt Lake City in 2002 and a heartbroken gold-medal favorite who faltered in Sochi in 2014. America's greatest cross-country skier of all time – a status Randall can claim now that she has an Olympic medal in her pocket – capped her career in the most glorious way imaginable. Like the baseball star who homers in his final at-bat, Randall scripted a storybook ending to a golden career that includes three World Championship medals, three World Cup sprint titles and numerous World Cup podium finishes. And, at long last, an Olympic medal. "I think of it as a story that I might read to my son one day. It's a fairy tale," Randall said. "I remember competing in my first Olympics in Salt Lake City, finished 44th and feeling so far from that podium and yet still feeling that glimmer of hope. And then progressively getting closer and closer in each Olympics." It's a fairy tale for Diggins, too, a two-time Olympian who said she still has a poster of Koch hanging on a bedroom wall back home in Afton, Minnesota. Like Randall, Diggins owns three World Championship medals, including two in the team sprint — gold in 2013 with Randall and bronze last year with Anchorage's Sadie Bjornsen. Diggins ranks third in this season's World Cup standings, and twice in Pyeongchang she came agonizingly close to a medal, finishing 3.3 seconds off the podium in one race and 4.6 away from bronze in another. 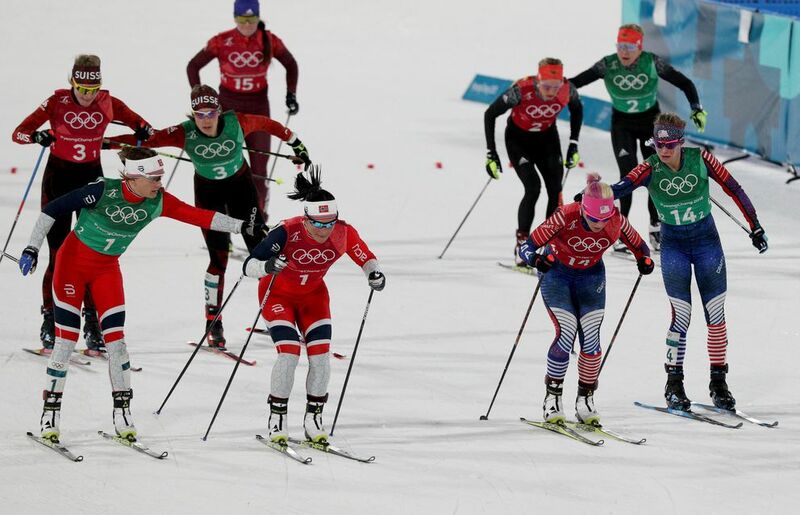 The Americans were part of a big lead pack for the entire race until Diggins, Nilsson and Norway's Maiken Caspersen Fall made it a three-team race in the final leg. With a few hundred meters to go, Diggins and Nilsson surged ahead of Fall to make it a two-woman race for the gold. Diggins was right behind Nilsson until the final dozen meters or so, when she moved to her right to create space to make her bid for victory. She took the lead with a ski-length or two to go and sealed the victory with her lunge. "It took a lot of hard work and a lot of sweat and a lot of belief," Diggins said of the buildup to this golden moment. "But for me the biggest thing was seeing the team and knowing that Kikkan was waiting for me at the finish line. When your teammate's waiting for you and you know their dreams are on the line as well as yours, that brings out the absolute best in me every single time." Both women spoke about their drive to succeed as a team. They are part of a U.S. team that has gone from participant to powerhouse during Randall's reign – Bjornsen is ranked seventh in the world and Vermont's Sophie Caldwell is ranked 17th – and they mean it when they post on social media that they are #bettertogether. After her disappointment in Sochi, where she was a medal contender in the freestyle sprint but failed to advance to the quarterfinals, Randall had to decide whether to keep racing or start a family with husband, Jeff Ellis. As it turned out, she did both. She gave birth to Breck in April 2016, and in her comeback season she claimed a bronze medal in the freestyle sprint at the World Championships. It was the idea of helping the U.S. break into the medals in Pyeongchang in one of the team events — the 4x5K relay or the team sprint – that inspired her to stick around for one more Olympics, she said. "When we really started to build this team, that's when I really began to flourish," Randall said. "… I've learned as much from them as I hope they've learned from me, and it's really what really motivated me to go for this fifth Olympics. "… I couldn't imagine a better way to finish my career (than) to win a medal in a team event." Beth Bragg is the sports editor for Anchorage Daily News.